The University of Algarve has just organized the 3rd edition of the UAlg Summer Courses. These offer the young students insight over many different areas like art & design, sciences, communications, sports, economy, management & tourism, engineering, medicine and sociology. Another eLab’s workshop was organized last month, November 28th. On this workshop, participants were given the opportunity of learning to use the Arduino, a single board open source platform with a microcontroller, very famous for its flexibility and for being easy to use by artists and beginners. After another workshop in eLab, we can be proud for organizing another successful event. In this second workshop, all the participants had the opportunity to learn about some of the most common methods used for the homemade manufacture of printed circuit boards. 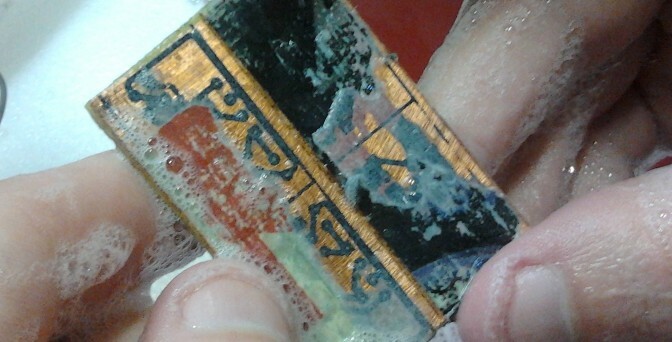 A total of 5 methods of transferring the circuitry to the board were demonstrated: UV light exposure with acetate sheet and greaseproof paper, toner transfer to a magazine sheet and to foil and finally by applying a negative dry film. Also, 2 corrosion processes were demonstrated: through iron perchlorate and through a mixture of muriatic acid and hydrogen peroxide. eLab will organize a new workshop about “Electronic instrumentation for beginners based on Arduino” in November 28th at 5.30 pm. We announce that eLab will organize its second workshop next Wednesday, November 21st at 4.30 pm. This workshop will be about the different methods for making PCBs (printed circuit boards), where each participant will have the opportunity to learn about some common methods and make its own PCB. In the middle of a project we are developing, we felt the need to create some PCBs (printed circuit boards) so we used the opportunity to prepare our next workshop. 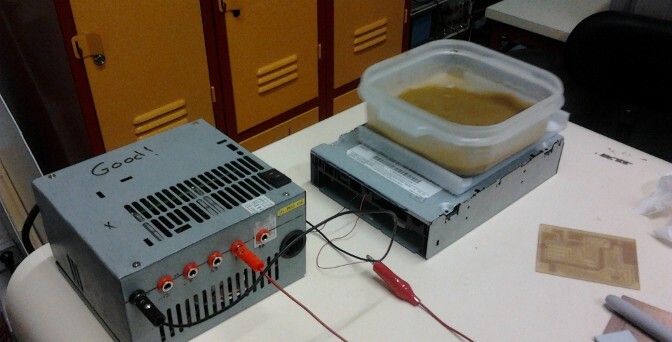 We experimented and got to know a new method for creating PCBs, a method usually known as toner transfer. eLab’s first activity was a success, we had a full house and a very positive feedback from the participants. For 4 hours we had a great team spirit, lots of fun and everybody learned without even noticing. We are proud to announce that eLab will organize its first workshop. 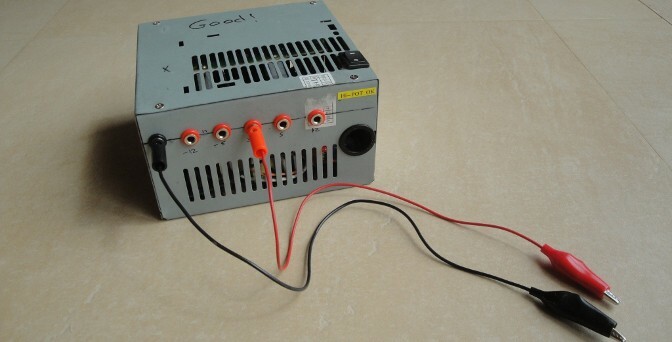 In this workshop we will show you how to convert an ATX power supply unit (PSU) from an old computer, into a very simple Lab power supply with the most common voltages (-12V, -5V, 3.3V, 5V and 12V). Very useful for electronic beginners who are in need of a power source for designing, building and testing circuits. 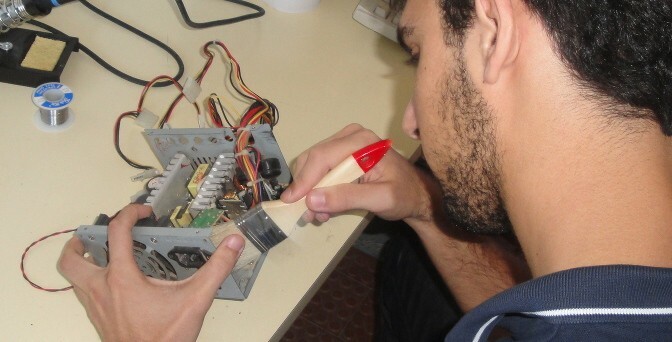 Each participant will have the opportunity of acquiring basic knowledge about an ATX PSU and put it to the test converting their own power supply provided by eLab.